Who said a simple kit can’t be great to build?! I was browsing eBay one day when I stumbled across this kit for sale and I instantly fell in love! At the time I didn’t know the kit existed and I was still naive when it came to models from manufacturers such as Fujimi and Aoshima. I put a bid in, then a maximum bid to make sure, and thankfully I won it for the original bid! This kit means a lot to me, for one single reason. It was the first kit I unboxed and reviewed on my YouTube channel! This was a few years ago now and I have improved my technique and filming conditions somewhat since then. I often think whether I should “re review” the kits I did years ago with a much more improved visual and audio experience, but that’s another story. My plan from the beginning was to build it in a fresh way, a bright paint job, but simple and subtle! The body was painted with Rover Kingfisher blue from a Halfords rattle can. Then cleared with Tamiya Pearl Clear and then given a light polish. One of my favourite parts of a model to build is the chassis. Now being a semi snap fit kit, I was surprised at the amount of detail Fujimi had gone to on this kit. The interior unfortunately didn’t really do it for me, and those rear seats had to go completely! I also swapped the front seats for a set from an Aoshima Honda Beat. The seat backs were filled in with styrene too. The dashboard needed a little something to make it pop. That thing turned out to be a piece of clear plastic to give the dials a more realistic look. The wheels included in the kit are fantastic, so much so that I wanted to save them for another build. I find picking wheels and colours the hardest part of model building. After a good friend of mine Ricky sent me a nice bundle of parts and wheels I knew straight away that the 3 spoke chrome wheels from a Fujimi Honda S-MX would be right at home under the Samurai! After quite a few problems during the build, and eventually giving up on it for nearly a year. I was determined to finish the kit, something that took me all of 3 days of work to wrap up. At the end of it I wished I had finished it earlier! 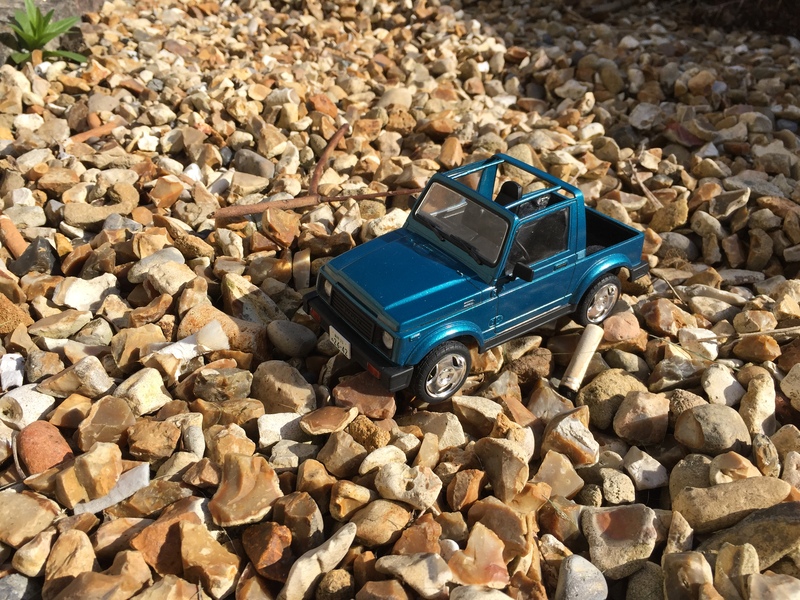 Here are some photos of the little 4×4 outside in its natural habitat. One thing left to do it just to paint the side repeaters…I wont leave that a year to do!